Players wear a hockey helmet with face mask, gloves, and body protection along with shoulder pads, shin guards, elbow pads, neck guard, and hockey gloves. Goalies wear the same equipment but with some modifications to the glove. The metal picks are attached to the backside of the glove allowing the goalie to maneuver. Inspite of one, the players use two hockey sticks for propulsion, passing and shooting. The sticks may be up to 100 cm long but generally range between 75-95 cm and are made of wood, aluminum, or composite materials. The sticks consist of metal picks on one end for players to propel themselves. The players who do not have a complete grip on the stick have an option to secure the stick to their hands so that they may also play the same way. The sledges are made of light-gauge aluminium with a customized basin in there to sit in. It also has a backrest which can be used as per the moving ability of the athlete. 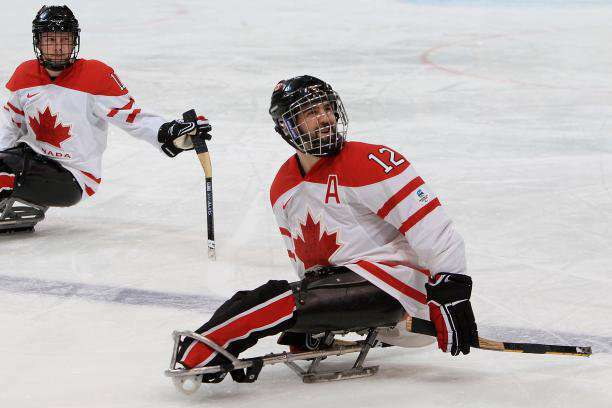 The frame of the sledge supports the legs and feet, and is affixed on two skate blades which are attached under the bucket while the straps tied around the waist of the player keeps him safe and secure so that he does not fall off from the sledge.